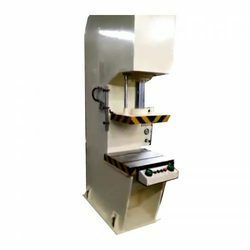 For the varied requirements of our clients, we are engaged in manufacturing & supplying a wide array of C Frame Hydraulic Power Press. These products are dimensionally accurate and needs low maintenance. High mechanical strength and longer functional life are considered as some of the main characteristics of these products. We are offering these products at economical rates. Looking for C Frame Power Press Machine ?